Daily Illuminator: Get All Wound Up With The Latest Pyramid! January 23, 2012: Get All Wound Up With The Latest Pyramid! 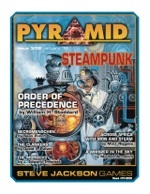 Even more satisfying than the antique cogwork time machine you keep in your basement, the latest issue of everyone's favorite magazine for roleplayers -- Pyramid #3/39: Steampunk -- should sate your appetite for all things Victorian. It includes William H. Stoddard's look at the social system of the era, using the rules and guidelines he forged in GURPS Social Engineering. It also features a Trans-Kenyan railway campaign expansion by Matt Riggsby (including GURPS stats for a personal airship), a system to create steampunk-flavored zombies in GURPS by Sean Punch, and an exciting adventure outline by David L. Pulver (with GURPS stats for various steampunk weapon and vehicles). This issue bulges at the seams with optional rules and information on steam-era gliders (including stats for five such vessels), plus a gang of systemless scalawags waiting to make mischief on your soot-stained streets. So if you ever wanted to escape from a band of mad-scientist-forged zombies by using a Trans-Kenyan railcar to launch your glider, having been driven to such an act because your social situation with the deadly Mohock gang deteriorated enough that they stole your mole machine, then Pyramid #3/39: Steampunk is -- without a doubt -- the perfect issue for you. And if you didn't already want to have that adventure, you probably do now . . .